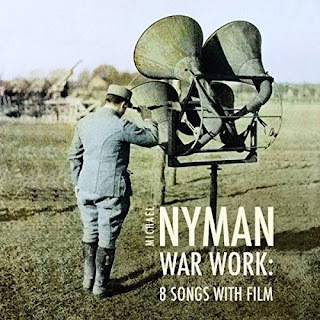 Michael Nyman's War Work: Eight Songs with Film was originally produced to go with film; edited by Max Pugh the film uses found footage from the First World War without narration thus providing a synthesis of visual image and music. This disc, from Nyman's own label MN Records, provides us with the music on its own played by the Michael Nyman Band with mezzo-soprano Hilary Summers. There are eight songs, presented in two groups separated by instrumental music. The poets Nyman has chosen are mainly poets from World War One who died in the conflict, except for David Bomberg. The poets set come from both sides of the conflict with texts by August Stramm (1874-1915), David Bomberg (1890-1957), Ernst Stadler (1883-1914), Guillaume Apollinaire (1880-1918), Geza Gyoni (1884-1917), Isaac Rosenberg (1890-1918) and Alfred Lichenstein (1889-1914). The initial group of four instrumental pieces start off sustained with strings to the fore but we soon have the familiar Nyman love of strong bass and richly intertwining lines with wind to the fore. Things get really interesting with the arrival of the first song Urtod this takes as its accompaniment Nyman's re-working of the Kyrie from Rossini's Petite Messe Solonelle given a low, dark heavy make over, and over this Hilary Summers intones the individual words which make up August Stramm's poem (written one word per line). It makes for high octane stuff. Each of the poems is paired with a piece of existing music, with Nyman selecting widely and pairing composers and poets from countries on different sides of the conflict. What's Left of the Soldier Man pairs David Bomberg with Beethoven's Violin Concerto with Summers intoning an almost plainchant-like melody over the slow movement from the Beethoven. It is a fascinating re-working, which does create something new and intriguing. Kinder vor einem Londoner armenspeise Haus by Ernst Stadler is paired with Orlando Gibbon's The Lord of Salisbury his Pavan and Gallardo to create something with strong overtones, surprisingly, of Hanns Eisler! August Stramm's Haidekampf is accompanied by a heavy rhythmic version (with low doubling) of Schubert's Sonata No. 15 in B flat, and again Stramm's poem is a series of one words, spat out by Summers. Though clearly based on Schubert, the result is pure Nyman as well. Guillaume Apollinaire's L'Adieu du Cavalier is paired with an equally striking re-working of John Bull's Bull's Good Night which gives a Kurt Weill-ish gloss to Bull's music. Geza Gyoni's For Just One Night uses Chopin's Prelude No. 15 and like the Stramm/Schubert, the original is quite clear whilst Nyman's voice is heard too in the way he combines the orchestration (again with heavy lower octave doubling) with the expressive vocal line. Louse Hunting by Isaac Rosenberg uses Franck's Violin Sonata and here the original material virtually resists transformation so we hear what is very much Franck with a counter-melody, rather than an intriguing synthesis. Abschied sets Alfred Lichtenstein over more of the Schubert sonata, to rather haunting and expressive effect, especially when one realises the sonata was one of Schubert's last. Another composer hovers over this music too, that of Kurt Weill and many of the orchestrations sound as if they have been passed through a 1920's Kurt Weill filter, which is no bad thing. Nyman's band (string quartet, saxophones, flute, trumpet, french horn, bass trombone, bass guitar and piano) is very much the sort of band you could imagine playing some of the Brecht/Weill pieces. Many of the pieces, especially the songs, seem to be remarkably loud (this was also one of Ivan Hewett's comments in his review of the live event last year). And the songs seem to sometimes lie uncomfortably for Hilary Summers' contralto, but she gives a wonderfully trenchant performance. The CD comes with a booklet in which Nyman explains some of the background to the songs, and there are full texts and translations. I would be intrigued to see the film with this music, but listening on its own I was rather taken with it and found the combination of the Michael Nyman sound-world with the 'foreign' composers produced something striking and with not a little wit.